Online Bitcoin poker first became an option for poker players after the closure of a number of online poker sites by the US Department of Justice in April 2011 – a date known in the online poker community as “Black Friday”. The Department of Justice alleged that these poker sites were operating in breach of the Unlawful Internet Gambling Enforcement Act (UIGEA), a law passed in 2006 which prohibited the processing of payments in and out of players´ accounts. The closure of PokerStars, Full Tilt Poker and poker sites on the Cereus Network in the US led a lot of people to mistakenly believe that UIGEA and the subsequent actions of the Department of Justice made playing online poker in US illegal. However, those with a clearer understanding of the law knew that if there was a way to bypass the legislation prohibiting payment processing, it would be possible to continue playing online poker in the US – legally. Hence Bitcoin Poker was born. The section of UIGEA which is relevant to payment processing for online poker is § 5363. This section lists the various methods of transferring funds in and out of online gambling accounts which are prohibited. There is no mention in this section of peer-to-peer transfers or cryptocurrencies – even though digital ecash protocols have been around since 1994. With nothing in law to prevent Bitcoin transactions, the concept of playing online poker with the cryptocurrency quickly took off. Bitcoin poker was not only popular with poker players, but also with currency libertarians – which led to some easy pickings in the days of the first Bitcoin poker sites and attracted more poker players to investigate the concept. Taking things one step further, bitcoins are not recognized by governments as being legal tender, therefore you are not playing poker with real money according to any and all legal entities. Because bitcoins are not controlled by governments and are not touched by large financial and banking institutions, the transfer of funds to and from real money poker accounts is in no way illegal. Of course, none of this stops some people from believing that all forms of online poker are illegal in the United States. US poker sites are looking to increase the volume of players using Bitcoin by offering special bonuses and promotions over the festive season. WPN CEO Phil Nagy stated recently that deposits and withdrawals via cryptocurrencies account for 60% of the action. A revamped weekend tournament schedule at US-friendly BetOnline Poker features a bonanza of events that total more than $250,000 in guaranteed prize money. Due to the increasing profile of Bitcoin, several “mainstream” online poker sites also allowed players to deposit and withdraw using the cryptocurrency. Although these sites were not strictly “Bitcoin Poker sites” – as they converted Bitcoin deposits into US dollars for play at the tables – they offered the opportunity for players to compete on sites that had a higher level of traffic, more valuable tournaments and more rewarding VIP programs. The great thing about Bitcoin (apparently the singular is the correct form of address) is that you do not have to understand anything about the concept of how cryptocurrencies work in order to play online poker with Bitcoin. Using Bitcoin to play online poker is easy, safe and – if you chose the right poker sites that accept Bitcoin – potentially lucrative. In addition to many sites that you may have heard of beginning to offer bitcoin poker, there has been a major influx of other, entirely new sites looking to grab ahold of this new, lucrative market. In the years that followed the introduction of bitcoin poker, sites emerged and really pulled away from the pack. Nowadays, some of the best bitcoin poker websites emerged as bitcoin-only sites rather than extensions of pre-existing sites. In addition to being a peer-to-peer currency over which governments have little control, Bitcoins are mostly bought and sold over the Internet. This means that (with no banks involved) transaction charges are kept to a minimum. As many online poker players will appreciate, regularly losing 4 percent or more of your bankroll on a currency transaction can make the difference between your online poker experience being profitable or not. With no financial middle man to pay, you will consistently see that fees associated with bitcoin deposits are much smaller than they are with fiat currencies. This is something you should always research before committing to a site and making a deposit, but it is true more often than not. Another advantage associated with playing online poker with bitcoins is the speed with which withdrawals are processed. Once again, because you are not dealing with any major, multinational financial institution, payouts tend to take place in moments rather than days or weeks. 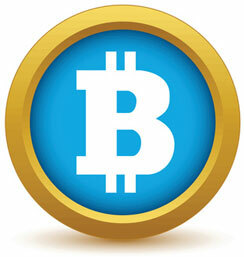 A third advantage offered by bitcoin poker rooms is the anonymity tied to deposits and withdrawals. When you play at traditional sites, it is a necessity that personal and financial information be offered up in order to execute a transaction. With bitcoins, however, every transaction—though tracked and logged for transparency purposes—is completely anonymous. This means that you do not even need to put your first and last name out there, let alone your bank account and routing numbers. For people who are concerned about keeping their personal information safe and secure, bitcoin presents endless opportunities to do exactly that. The primary disadvantage of playing online poker with Bitcoin is that the value of the cryptocurrency in relation to other currencies can be volatile. Although the risk of a negative fluctuation is mitigated by online poker sites that convert Bitcoin to US dollars, players on sites that are Bitcoin-exclusive can see the value of their bankrolls increase or decrease dramatically irrespective of how they perform at the poker tables. If you are new to playing Bitcoin Poker, we recommend that you review our “Bitcoin Poker FAQ” and “How to Buy and Sell Bitcoin” page. If you are familiar with the cryptocurrency, and just want to find the best online poker site for Bitcoin, head on over to our “Bitcoin Poker Sites” page for a summary of the best sites offering online poker for Bitcoin, or click on any of our reviews on the left hand side of this page. BitcoinsPoker.com aims to provide up-to-date information relating to all these questions and more; with a regularly updated online Bitcoin poker news section and reviews of online Bitcoin poker sites which offer a tried and tested solution for players wishing to play poker with Bitcoins. BitcoinsPoker.com also includes links to referenced sources of further information as we do not pretend to be a comprehensive authority on Bitcoin. We do, however, know a thing or two about playing online poker with Bitcoin and look forward to meeting you at the virtual tables!